Going off on a food tangent, a blogger younger and more famous than I points us to StillTasty.com, where you can find information about whether one should eat left-overs or food bought and left uncooked for a reasonably long period. Lacking, however, is an entry for Vegemite, which would be of great salience: I have run out of my small jar (I could get another one at the store, but… they’re small) but discovered to my delight a large jar in an office drawer that my mother must have sent to me in… 200x. 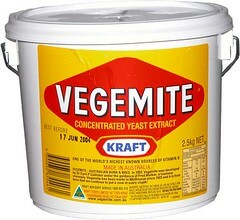 The quote-unquote expiry date was about a year ago—but Vegemite doesn’t go off, does it? In any event, it tastes fine, & I will keep you updated on developments. Matt’s post on why Melbourne Cup winners don’t feature in the deli at Woolworths is not quite the celebration of abstemiousness I would like it to be. For it is not vegetarianism with which he seems to have become comfortable so much as ideologues holding positions without explicable justification. Read that way, it is a vindication of the whining hippies. 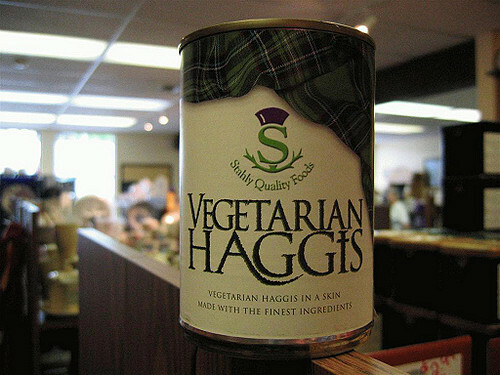 I believe that 'finest ingredients' refers to the haggis and not the skin. Also, a note to Stahly's: when you label your produce as 'quality', you're actually giving the game away. Image by flickr user selva. So goes an old saying. Here in Italy though, you just need to be a bit peckish. A quick trip to any local supermarket will allow you to purchase ‘carne equine’ at prices competitive with beef, pork and chicken. Horse meat is not at all unusual and has comparable shelf space to other meats in most shops. Coming from Australia (and probably elsewhere in the British colonial origin western world) it’s a pretty shocking sight to see, and made me feel a bit queasy until I got used to it. My wife made an interesting comment that got me thinking though; “this must be how vegetarians must feel about eating any meat”. I remember in years gone by being a bit of an arse to pale starving vegos. If someone said they were vegetarian I would almost always ask them why. By refusing to eat what I was happy to, they must have had some smug feeling of moral superiority over me and since I didn’t agree with the moral stand I felt I had to force them to justify it. It surprised me that the whining hippies would often be offended by my insistence they justify their culinary preference. Part of this comes from my country origins. I grew up on a small farm and from a young age became accustomed to the cradle to the plate cycle of farm animal life. One of our goats, Bonney, consistently dropped twins that me and my siblings gave cute childish names like spearmint and peppermint, and coca-cola and pepsi. We were completely comfortable a few months after hand rearing them to see them on the plate, usually as corned goat served with white sauce, yum! We even referred to them by name “we’re eating peppermint tonight”. When I was growing up I knew very few vegetarians. Upon moving to ‘the city’ for university studies I met a lot of city dwelling vegos. From my chip-on-the-shoulder country kid viewpoint most of these seemed like vapid and clueless wordsmiths who seemed to believe that meat eaters would never eat meat if they ‘really knew’ where it came from. Since most of these people wouldn’t be seen dead in the outer suburbs of their own city, let alone having ever ventured to the kind of place where I grew up, I quickly associated ‘vegetarian’ with ‘private school chardonnay socialist wanker’ and this connection in my mind stuck for quite some time. others to choose to abstain. I no longer question a fellow diners non-meat order any more than I would question the choice of rice over pasta ( I still don’t know why anyone would feel the need to drink white wine when red was available, but that’s another story). while horses are almost certainly more intelligent than cows, I’m not sure if they would beat pigs in a battle of wits and in any case I’m not sure that the anti-whaling lobby has the right idea by linking assumed intelligence with eat-ability. There seems little difference in terms of environment effects, cruelty or anything else between farming and eating horses and cows. So why wouldn’t I eat a horse? I don’t know, I just don’t want to. And that, I think, makes me finally understand vegetarians. It’s not necessarily an ethical, political, economic or health based position (though of course it can be in part). Plenty of vegos have told me they just don’t like meat. Impossible! I would think, while devouring a bacon and egg roll. Now I finally get it. Everytime I see a vego refusing to eat meat I can just imagine it’s horse they’re being offered, and I can finally see where they are coming from. Apart from being almost completely wrong (anyone can ask anyone else a question during question time). The article contradicted itself later on. Since I couldn’t trust the basics I gave up on Wiki and went to Google to find the info I was after. Of course, the first few hits were this bogus Wiki page, and many of the other high rating hits linked back to it! It seems that the decay rate of misinformation on the web has been significantly increased thanks to the rise of Wikipedia. In the past I’ve always found Wikipedia quite useful and I use it frequently for historical, geographical and even scientific questions. There is always a bit of controversy about wiki when someone vandalises the page of some eminant person, but since most of these are restricted to US culture wars it has never bothered me. What this little episode demonstrated to me though is that sloppy errors can quickly grow and solidify due to the self referential loop of the Wikipedia/Google system.